My Christmas decorating almost always starts with my mantel. And this year was no exception. But this is the second I’ve done so far this year! I’m pretty sure it will be the last. Have your ever had an idea in your mind how you want something to look, but after executing your vision… it should have just stayed an idea in your mind? That was the first Christmas mantel. While I was rooting around in the basement I found this long forgotten old, chippy window and that sparked a new mantel idea. The new mantel has a definite Farmhouse feel. And it is so light and bright! 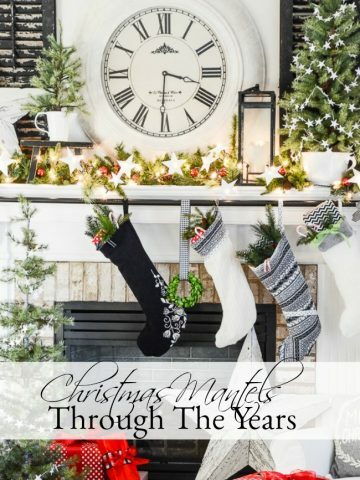 The focal point of this year’s mantel is an old, chippy window that is propped up against the wall. 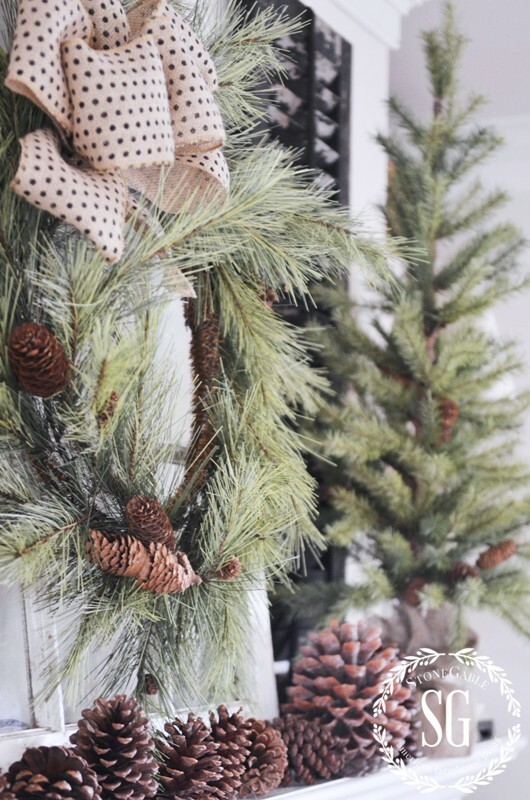 I hung a pine wreath from a burlap ribbon on the window. This year my mantel has lots of organic and no traditional Christmas colors. Just colors of nature! 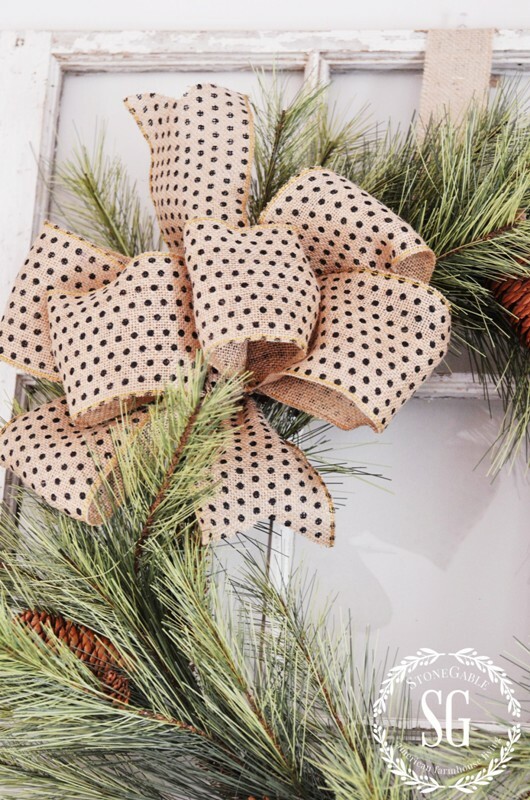 Isn’t this a fun burlap polka dot bow? If you like this bow HERE is an easy tutorial, so you can make one too! 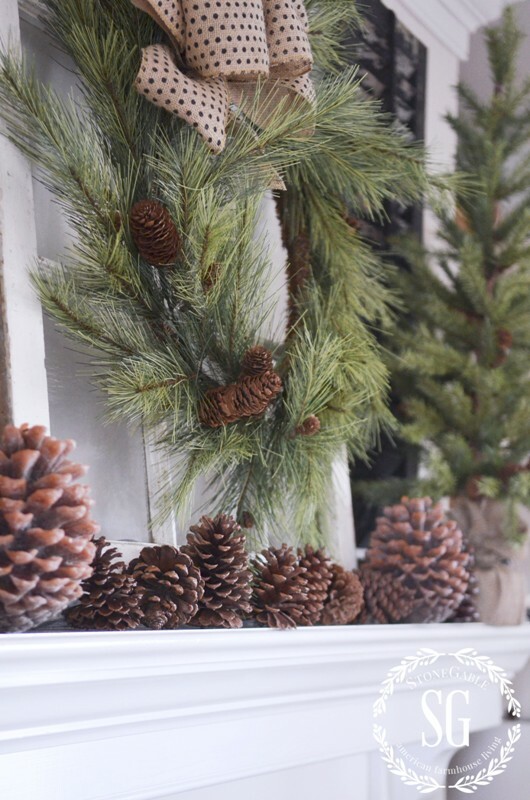 Pinecones stand in a little straight line on the mantel ledge!!! Some are candles… can you tell the difference? Just like the wreath, this tall tree is also a pine! I’m loving the long needles and wispy look of pine this year! 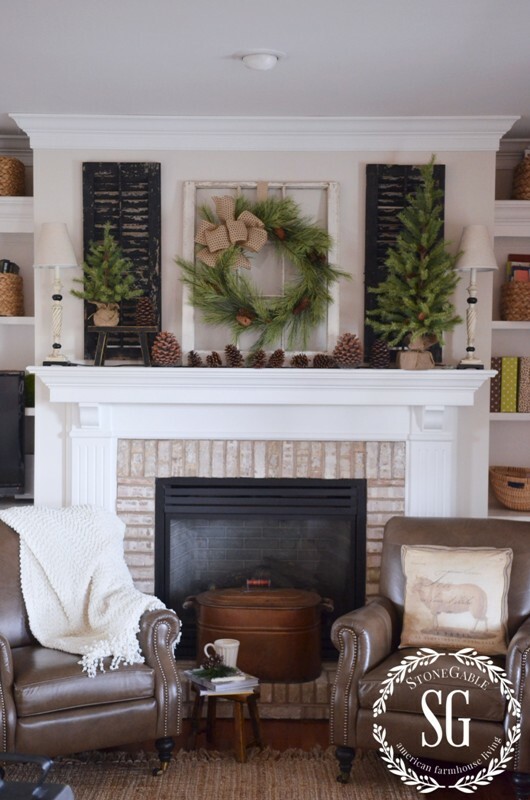 My Christmas mantel sets the tone for the rest of my Christmas decor this year! Stay tuned for more Christmas decor! You might want to pin this to your CHRISTMAS or MANTEL Pinterest board. 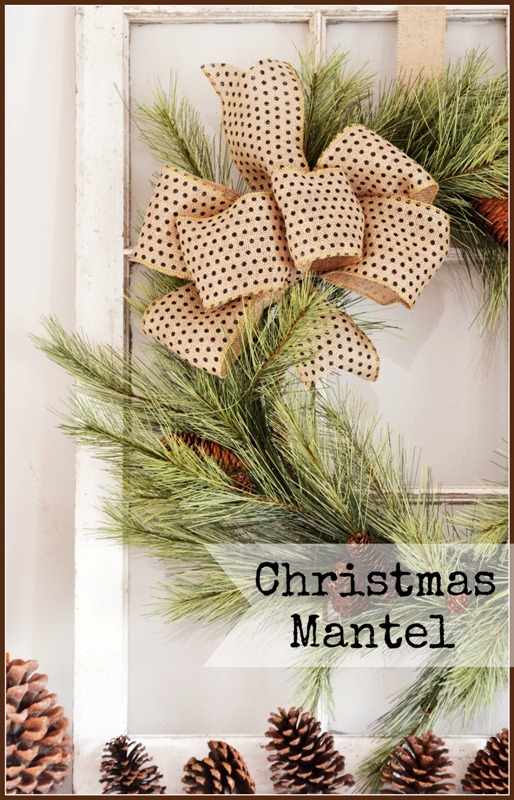 And follow me HERE to see what Christmas things I’m pinning! 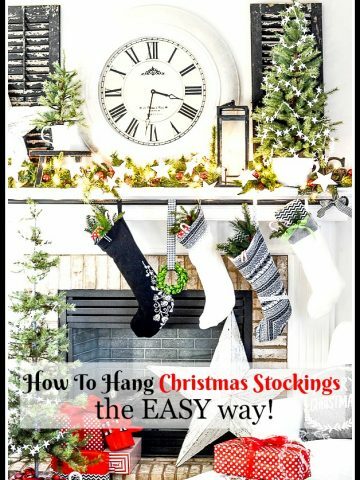 HOW TO HANG CHRISTMAS STOCKINGS THE EASY WAY! What is the size of your window frame? It is a standard single hung window. Simple beauty and a quiet ambience! Great idea, think I will incorporate! Hello! Your room is gorgeous. Would you share the color paint used on the walls? Hi Candice. Thanks so much! You can read all about my wall color here: http://www.stonegableblog.com/tips-for-interior-paint-colors/. Hope this helps! Love this! I have been looking for shutters similar to yours, do you know the size or dimensions of them? What black paint did you use to paint the shutters? I think I read somewhere the brand name, but cannot find it now…thanks. Or if the shutters are not black, what do you recommend it? These shutters came this way. If I had to paint them I’d use Annie Sloan Chalk Paint in Charcoal! Beautiful mantel! Can you tell me what brick or stone you have around your fireplace? Color, brand or any info you might have. Thanks! I Love it! The surround is a facade. We covered a green marble tile with thin brick. I don’t know what the color, brand, etc is. So sorry. I did not save the info. I adore the chippy vintage window on your mantle!!! mainly because I refuse to “over” decorate for the holidays!!! As “Mr. Ed” continues to improve, I find myself on that start~stop cycle of home decor. Saturday is planned for a whole day to complete the upper level living areas. . . I absolutely love your mantel! Hi Yvonne, I’m getting ready to decorate our mantle and hope to recreate my design from last year. 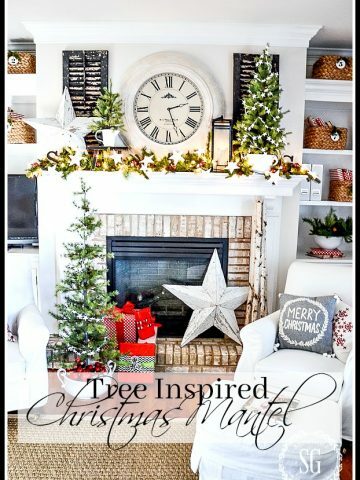 I used lots of crystal and twinkle lights with several small trees as well as a swag of faux greens that hung down a bit like Spanish moss. The crystal really reflected the lights. So beautifully. I called it my Charleston mantle and served Christmasy mint juleps at our annual Christmas House party. Thanks for sharing your beautiful mantle! Oh, your mantel is LOVELY! 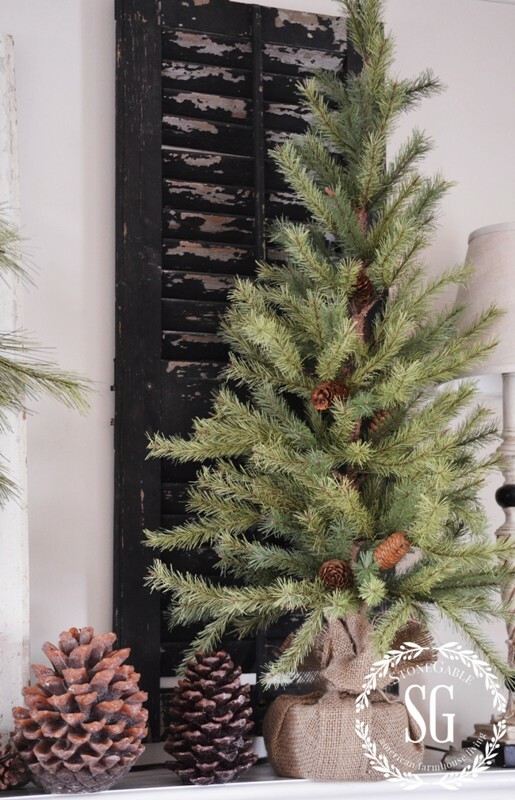 I love the chippy shutters with the natural greenery and pine cones – simple & warm. I’m thankful for all that you share with us. Have a wonderful Thanksgiving! I love the pine cone candles! Happy Thanksgiving to you and yours. This is my type of style.. I absolutely love it! Pinning this to show to my husband……I bought an old window from a rural country schoolhouse, where my cousin taught, 50 plus years ago. I planned on putting it on my mantle and husband thought I was insane…..still does! I gave the window to my daughter-in-law and have been sorry ever since! Your mantle is simple, elegant and lovely. P.S. : my pinecones are beribboned and ready for the tree! Thanks again for sharing your talent! Have a very blessed Thanksgiving! Beautiful Yvonne. Luv the natural simplicity of it. Glad to see a lot of natural ideas floating around blogland this season. Yvonne, I just love this! Simple but still a great focal point. The windows, shutters and ribbon make it look so welcoming. I’m definitely Pinning this. Haven’t decided what I’m doing yet. Elegant but simple. 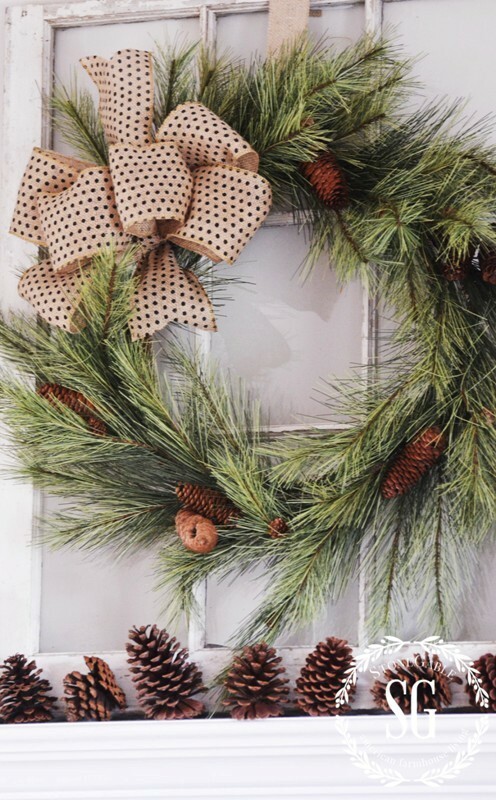 What lovely formula of pine, pine cones and burlap. And that polka dot burlap is the finishing touch! Beautiful! 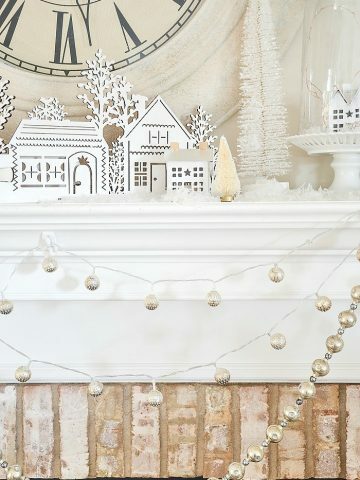 I love your simple but very pretty mantle! Beautiful mantle! Where did u find the wreath and trees. They look real.. I love them! Love this look, the simplicity of it is so appealing. Great way to repurpose old items around the house. I love the simplicity of your mantle. My decorating will begin on Friday with the outside lights and porch. The mantle will be second on my list. As usual, always beautifully done…..and love the colors of the season…..Have a most wonderful Thanksgiving with your family Yvonne! Very pretty. I love the simplicity of the natural pieces. LOVE THIS! ANTICIPATION!!! I am saving this mantel for my bookmark. We are finally building farmhouse 2015. I can’t wait for your Christmas tour because of the beauty of the home, but the beauty of Christ in you that shines through and the beauty of family and food. Thank you for all you do! From a child of the King, wife, mother, and first grade teacher! Love it Yvonne … very pretty. I LOVE your mantel!! The window and shutters are great and I, too, love the look of pine; there are many great silk pines out in the marketplace, too. Did you find your burlap ribbon locally or did you order it? Thanks! Happy Thanksgiving!! I got the ribbon at JoAnne’s Fabric awhile back. I was looking though my ribbon stash and found it! Your mantle is beautiful. Love the shutters! Good thing you did some digging, what a treasure you found and it looks great with the wreath. Beautiful Yvonne! I love the natural beauty of pine and pine cones. And that window….it sets the mood. Happy Thanksgiving!